The brilliance of FC Barcelona’s three-forward combination of Luis Suarez, Lionel Messi, and Neymar was on display again as the Spanish club team added one more title to a banner year. Lionel Messi scored a goal and Luis Suarez added a double as FC Barcelona rolled to an impressive 3-0 victory over River Plate in the Club World Cup final on Dec. 2, 2015 at Yokohama International Stadium in Japan. Neymar added two assists for the champions from Barcelona who finished with five overall titles in 2015. 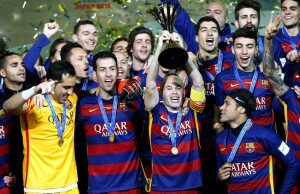 In order to win the world club champions crown, Barcelona had to overcome a strong start from River Plate, the 2015 Copa Libertadores champions. While River Plate displayed energy early, its keeper Marcelo Barovero made an outstanding save against Messi in the 13th minute, diving to his left to block a shot from 13 yards out. However, Messi would still put Barcelona on the board first when he got enough of his left foot on a Neymar header to flick a shot past Barovero into the lower right side of the net in the 36th minute. In the second half, Suarez took over. The forward from Uruguay collected a Sergio Busquets long ball over River Plate’s high press to beat Barovero in a breakaway in the 49th minute for a two-goal lead. Then in the 68th minute, Messi won the ball away from two River Plate defenders outside of the box and got it to Neymar on the left corner. The Brazilian star then flicked a short cross to the middle of the box where a Suarez header beat Barovero left side. At that point, Barcelona led 3-0 and were well on their way toward Club World Cup finals victory.